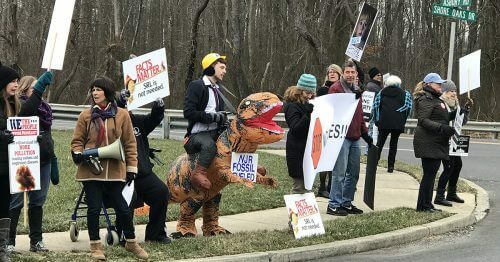 HOWELL, NJ (January 23, 2019) — Shareholders of New Jersey Resources Corporation (NYSE: NJR) were met by protesters outside the company’s annual meeting today. Carrying signs and raising their voices in opposition, New Jersey landowners and citizens made the case that NJR should end its involvement in two pipeline projects that aren’t needed and that take the state in the wrong direction for meeting energy needs. NJR is one of the primary companies behind the proposed PennEast pipeline, which is currently using eminent domain to seize nearly 150 private properties and preserved land in New Jersey. The pipeline lacks state approval, without which the pipeline cannot be built. Additionally, NJR recently began constructing the unneeded Southern Reliability Link (SRL) pipeline that would damage the fragile Pinelands, and put shareholders at risk since the project faces multiple unresolved legal challenges. “Putting profits ahead of residents’ rights and safety is no way to run a business. NJR should be ashamed of themselves for taking land from me and scores of other homeowners for an unneeded pipeline,” said Jacqueline Evans of Stockton, a homeowner in PennEast pipeline’s path. A poll conducted last fall showed that New Jersey voters strongly favor renewable energy sources like wind and solar over fossil fuels, such as natural gas. Seventy-five percent said the state should be investing in more renewable energy sources rather than fossil fuels and pipelines. Two-thirds of the state’s voters do not consider natural gas to be clean energy, an astounding 23-point increase since 2016, and more than half said New Jersey is moving too slowly to adopt renewable energy.